alls are framed with window and door bucks that are constructed as structural supports and distributed throughout the perimeter of the buildings. posts (4 x 4) are used at corners and at locations lacking window and door openings at no greater than six foot intervals. box columns, the width of the straw bales (18 inches) are used as the vertical sides of the bucks and extend from the foundation to the beam. Box columns consist of a structural frame of 2x lumber sheathed with plywood. 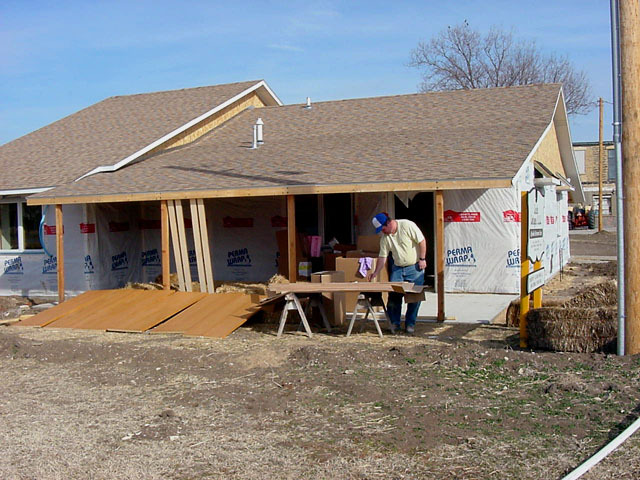 In some cases, dependent on roof loads, doubled 2 x 4s are used. dimensions 14 x 18 x 36 inches, are stacked like blocks between the framing members. exterior surfaces of the bale walls are covered with stucco netting fastened to the concrete slab. 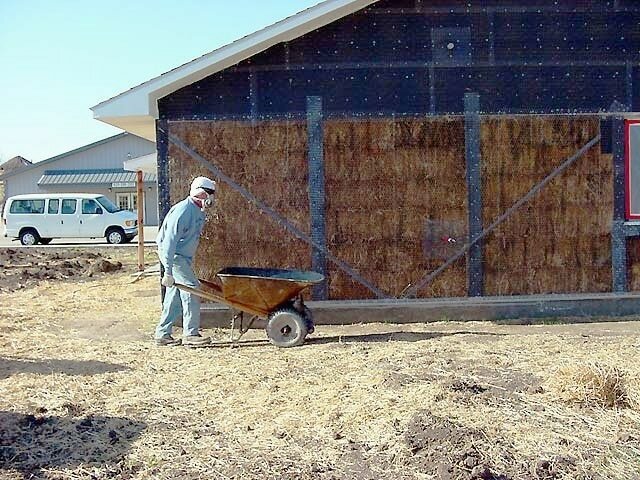 exterior bale surface are covered with reinforced fiberglass cement stucco at a thickness of approximately 1.5 inches. interior walls, including the interior surface of the bale walls are covered with sheet-rock. room stands independently from the rest of the building. walls and ceiling are constructed with 2 x 4 studs covered with a 1/8th inch thick steel plate and two layers of 3/4 inch plywood. walls are covered with one sheet of 5/8th inch sheetrock. are insulated to R-50 using 10-inch rolled fiberglass insulation with several inches of cellulose insulation blown on top.